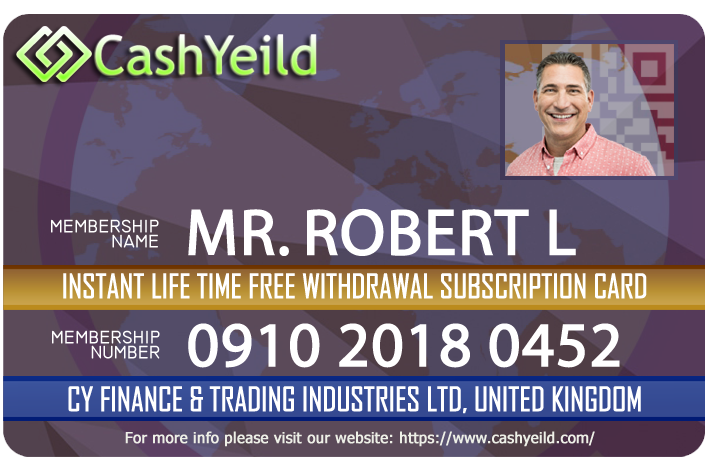 Instant Life Time Free Withdrawal Subscription Card is only for Big Investors who like to partake in these All Investment Plans. In Instant Life Time Free Withdrawal Subscription Card you are able to withdraw All Plans profit. Instant Life Time Free Withdrawal Subscription Card is for All Investors who like to partake in these All Investment Plans. This Instant Life Time Free Withdrawal Subscription Card Agreement and Disclosure Statement (Agreement) covers your Instant Life Time Free Withdrawal Subscription Card (Card) issued by CY Finance & Trading Industries Ltd. In this Agreement, the words "you", "your", and "yours" include any joint obligator, guarantor, authorized user, or the person whose name is embossed on the Card. The words "we", "us", and "our" mean CY Finance & Trading Industries Ltd. If you sign an application for a Card under this Agreement or sign or use any Card(s) issued, or allow others to use your Card, you will have accepted this Agreement just as if you signed it and you jointly and severally, will be bound by the following terms and conditions. (a) Read all the Instant Life Time Free Withdrawal Subscription Card fees and period. (b) Fee for Applying Instant Life Time Free Withdrawal Subscription Card is non-refundable. (c) After Applying Card will be issued under 24 Business Hours. (d) After making payment for Instant Life Time Free Withdrawal Subscription Card please fill all the required details because all required details are necessary if you miss any of field we are unable to process your order under 24 business hours. (e) Fee for Applying Instant Life Time Free Withdrawal Subscription Card is transferred to your CY Account Balance When Card Activated. © 2012-2019. CY.cash All Rights Reserved.